Another category of digital photography that interests many hobbyists and professionals is astronomy. There are already two PhotographyTalk.com articles with tips about shooting objects in the sky, Sunrise and Sunset Photography and Digital Photography—Techniques for Capturing Pictures of the Moon. A total or partial eclipse of the sun is an even more exciting opportunity to point your camera skywards, since they occur rarely and you must be in a specific position on the face of the Earth to see and photograph them. 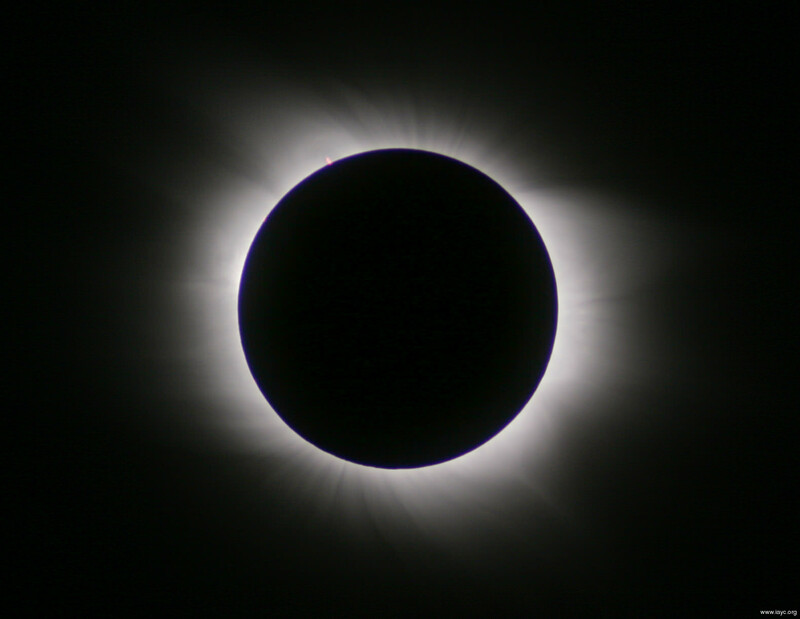 A total solar eclipse is when the moon blocks all of the sun’s direct light, revealing only the corona, which is invisible on a typical day. It’s easy to understand why our primitive ancestors thought the world was ending during a total solar eclipse, since the sky can become quite dark in the middle of the day and the stars are suddenly visible. On average, there is only one total solar eclipse per year and many of them only appear total at remote locations, such as the middle of an ocean. This makes them rarer than partial eclipses. During a partial eclipse, only part of the moon blocks the sun’s light. To the naked eye, even a partial eclipse of as much as 96% blockage will just seem as if a dense cloud has passed in front of the sun. It’s only when you photograph a partial solar eclipse that you can see the dramatic effect. Of course, a total solar eclipse also includes two periods of partial blockage: as the moon moves in position over the sun and then as it moves from in front of the sun. To capture exciting digital photos of either phenomenon requires some understanding of specific techniques and precautions. The most important tip when photographing solar eclipses is to NEVER stare at the sun or any part of it, directly, especially through a telescope or camera, since that can cause blindness. You need a very specific kind of filter that is made of either glass or Mylar. It will be coated with a virtually opaque layer of aluminum and only allow 1/1000th of one percent of the light to pass through the filter. This filter is attached to the large end of a telescope. The heat of the sun will crack a small solar filter attached to the telescope’s eyepiece. A #5 neutral-density filter is not a sufficient substitute. It may block most of the sunlight, but not enough of the ultraviolet, which will also blind you. You must also protect your camera, especially if it is digital. Looking at the sun through live view on the LCD will protect your eyes, but it could damage your sensor. Another challenge is the size of the sun in your image. That’s why shooting with a telescope is the best option. You can shoot the eclipse with your camera and lens and a protective filter, but the sun may be nothing more than the size of a dot. The reason is that the angle-of-view of a normal 50mm lens is 43 degrees; but the sun is only one-half of a degree, which means it will fill less than 1/80th of the width of your framed image. Even with a 500mm lens, the sun will still only be 1/10th the width, since the lens’ angle-of-view is five degrees. Attaching your camera to a telescope provides you with a big leap in focal length. For example, a five-inch telescope is the equivalent of a 1,200mm lens. Now, the sun will fill approximately half the height of a 35mm frame. You’ll need a specific adapter to attach your camera to a telescope. Read Part 2 of this PhotographyTalk.com article for more important tips to shoot excellent digital photos of a total or partial solar eclipse.